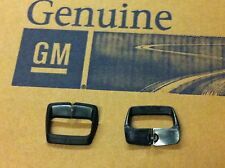 Pair (left and right) seat belt shoulder harness guides for 74 to 76 Camaro's and 74 to 77 Chevelle's. Office Hours Item must be in new condition and in original box. Seat Belt Mount Bolt, Chrome. New. 64-66 Chevy II, Chevelle. 64-66 Chevelle. 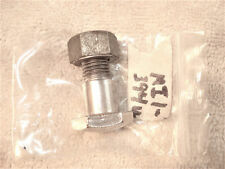 Seat Belt Anchor Mount Bolt, New. 7/16-13 x 1-3/16". Has the special round locking feature. 64-66 Chevy II. Also, check us out on the web! JnJ Vette Parts. 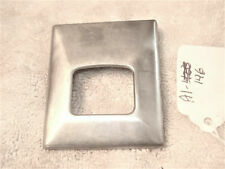 Seat Belt Buckle Cover Clip, Has "300" stamped on top end in second photo. Chevelle, Camaro, Chevy II. Also, check us out on the web! JnJ Vette Parts. Car Seat Belt Covers Shoulder Pads Chevrolet Chevelle SS Gray Embroidery 2 pcs. Car Seat Belt Pads x2 (1 Pair). Decrease The Discomfort of The Seat Belt. Full Velcro Closure For Easy Installation. Universal 5 Point 3" Adjustable Camlock Style Nylon Seat Belt Harness. Camlock Type Buckle, Snap-On Steel Mounting Plates With Eyebolts. Universal - Not A Direct Bolt On Item. We can provide minimal support, but we will try our best to help. Car Seat Belt Covers Shoulder Pads Chevrolet Chevelle Gray Embroidery 2 pcs. Universal 4 Point 2" Adjustable Snap-On Style Nylon Seat Belt Harness. PO BOX, GU, PR HI, AK,APO/FPO. USA 48 States. Universal 5 Point 3" Adjustable Camlock Style Nylon Seat Belt Harness. We can provide minimal support, but we will try our best to help. PO BOX, GU, PR HI, AK,APO/FPO. USA 48 States. Universal 5 Point 3" Adjustable Camlock Style Nylon Seat Belt Harness. We can provide minimal support, but we will try our best to help. NOTE : All of turbo parts and performance may require slight modification in order to fits perfectly. 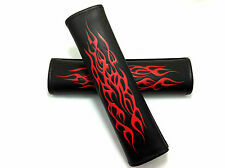 Car Seat Belt Covers Shoulder Pads Chevrolet Chevelle SS Red Embroidery 2 pcs. Install: Headrest mount. Exclusive design! Special Features: Latch connector bracket. This is a good solution for the back seat is without LATCH top connection point. Application2: For LATCH Hook Belt. Special Features: Latch connector bracket. This is a good solution for the back seat is without LATCH top connection point. Application2: For LATCH Hook Belt. Item Type: Seat Belts & Padding. Exclusive design! Exclusive design! Install: Headrest mount. Special Features: Latch connector bracket. This is a good solution for the back seat is without LATCH top connection point. Application2: For LATCH Hook Belt. Child safety seat LATCH Toptether. Common on LATCH Toptether interface safety seat (increased pad). This product realization through fixed safety seat LATCH Toptether seat more stable security. 1 x LATCH Toptether Connection Tape. Produced Standard: ECE R44-04 LATCH. Suitable for most of car baby safe seat, more steady and safe. We will reply you within 24- 48 hours. 1x seat belt extenders. Increases the size and improves comfort of your existing seat belt. This seat belt extension is designed to connect to your existing seatbelt. Perfect for safety and comfort, and ideal for use with baby and infant seats. 1x ISOFIX connection tape. 1Pair ISOFIX Guide Groove. Child safety seat Interface fixed soft connection tape You can connect a car seat and car holder together. Child safety seat LATCH Toptether. Common on LATCH Toptether interface safety seat (increased pad). 1x ISOFIX connection tape. 1Pair ISOFIX Guide Groove. Child safety seat LATCH Toptether. Child safety seat Interface fixed soft connection tape You can connect a car seat and car holder together. This product realization through fixed safety seat LATCH Toptether seat more stable security. Special Features: Latch connector bracket. Application2: For LATCH Hook Belt. This is a good solution for the back seat is without LATCH top connection point. Exclusive design! Fit for: baby car seats. Child safety seat Interface fixed soft connection tape You can connect a car seat and car holder together. Uses: Common on interface safety seat (increased pad). Interface fixed soft connection tape. Common on LATCH Toptether interface safety seat (increased pad).